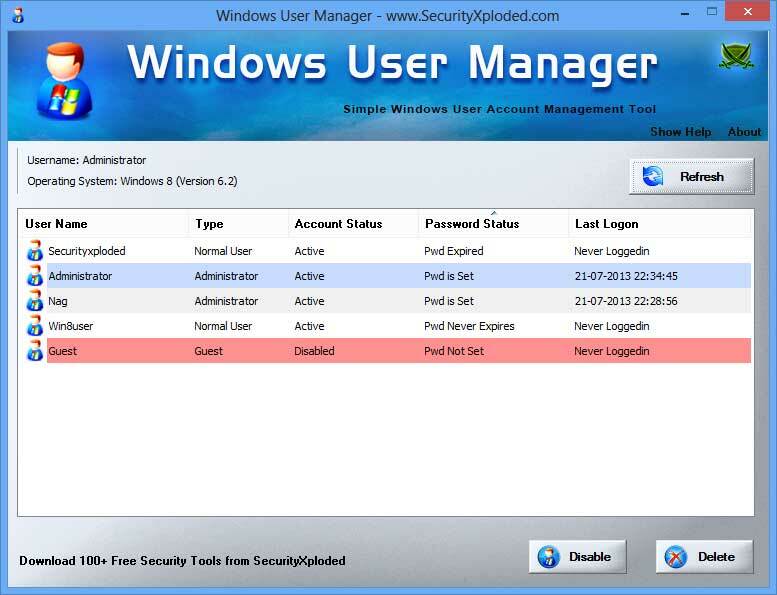 Windows User Manager is the free desktop tool to easily and quickly manage all the User accounts on your Windows system. You can select a user from the list then Enable/Disable or Delete that account with just a click of button. This will be useful in recent systems (win7, win8 etc) where built-in Administrator account is disabled by default and using this tool you can quickly enable it. Also it features Color based display for easier identification. Disabled user accounts are shown in red background color while Admin accounts are shown in blue color. It has cool GUI interface and very easy to use tool for all level of users. It is fully portable and does not require any other components such as .NET or Java. It works on both 32-bit and 64-bit systems starting from Windows XP to Windows 8. Windows User Manager comes with Installer to make it easier to install it locally on your system for regular usage. This installer has intuitive wizard which guides you through series of steps in completion of installation. Windows User Manager is easy to use with its simple GUI interface. It will list all user accounts as shown in the below screenshot. Disabled accounts are shown in Red & Admin users are shown in Blue color. Now you can select any user account then either Delete or Enable/Disable that account using the right buttons. Anytime you can click on 'Refresh' button to display the fresh list. To perform certain operations such as Delete, Enable/Disable user accounts you need admin privileges. In such cases make sure you run this tool as Administrator. 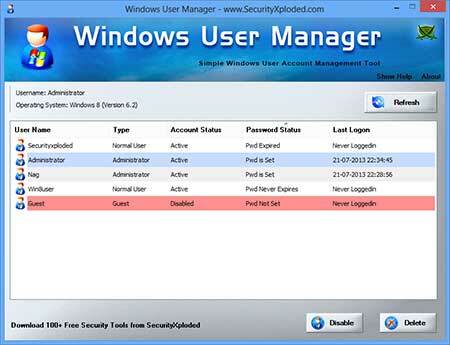 Windows User Manager showing all the user accounts with different colors on Windows 8 system.